Join us beginning on January 1st (only a couple days away!) 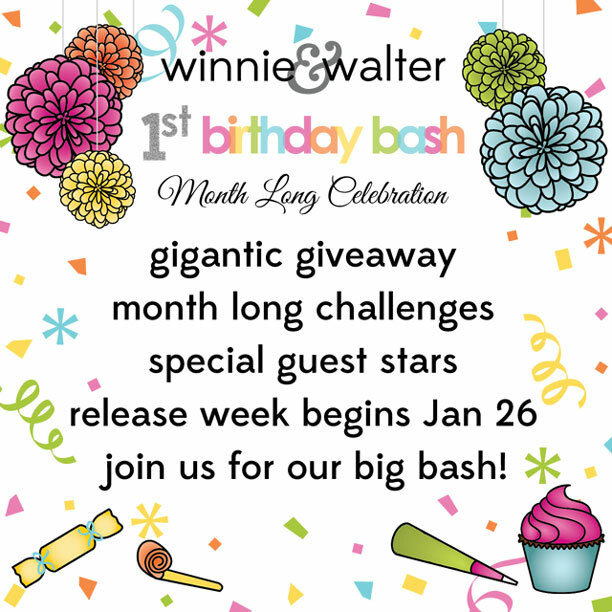 for our GIGANTIC giveaway and for a bunch of fun challenges that are open all month long! WHOOOOPEEEEEEE!!! I'll be there with bells on! Hard to believe it's been a year. Can't wait to party! HAPPY 1st Birthday Winnie & Walter!!! I so excited and can't wait to see what the new releases will be. Will definitely take part in the challenges too!!!! WOW! Can't believe it's been a year already! Big HUGE congrats to you guys - super well done!!! Sound awesome, Let's celebrate............can't wait!!!! Happy 1st Birthday! Looking forward to playing in the challenges (super cool, every one!) and the new release = EXCITED! You've sure prepared a wonderful birthday bash for us; thank you! !